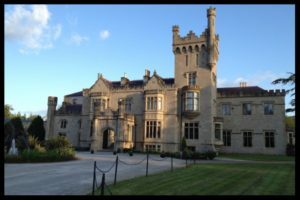 Last Sunday I attended Flormar’s Mastering Your Makeup Masterclass with the Flormar team and Michelle Regazzoli-Stone (Mrs Makeup) which was held in the stunning surroundings of Solis Lough Eske Castle, Donegal. 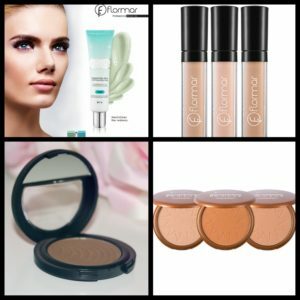 Flormar is an exciting affordable luxury makeup brand brought to Ireland by CEO Paul Mooney, and over the past year it has been dominating the makeup market in Ireland by storm. 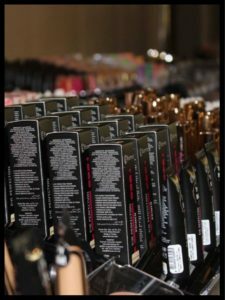 It has over 300 products in its range so far with everything you need for a full face of makeup, all at affordable prices, you will literally be blown away by the quality of this makeup for a fraction of the price that well known brands charge. 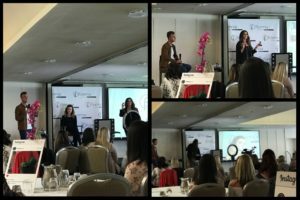 I had first been introduced to the Flormar brand last year at Ireland’s Beauty Show and having purchased a few products to try myself I knew straight away to expect big things from this brand and was so excited to attend the masterclass with the amazing Flormar Ireland team. 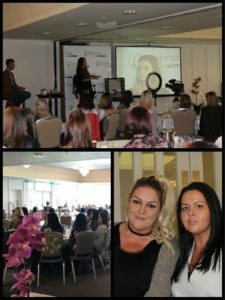 After introducing himself and making everyone feel extremely welcome Paul and his incredible team handed over the stage to the stunning and extremely talented Michelle Regazzoli-Stone. 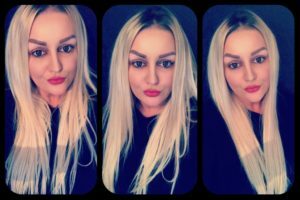 Michelle is a household name in the beauty industry and has several high profile celebrities as her clients not to mention regular stints on TV and is one of the most sought after makeup artists for brides in the Country. What I loved about Michelle’s demo was that she explained every step of her makeup application and discussed in detail about each product, its uses and benefits and covered every makeup dilemma that all us girls go through. 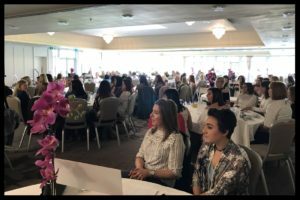 Her advice on everything from covering blemishes, oily skin, contouring, eyeliner flick to achieving a flawless finish, there wasn’t anything she didn’t cover and you can tell how passionate she is about her trade and the products she was using. Below are a list of the products she used to create this stunning look. CC Cream – Michelle used the peach colour corrector on the model but she explained about the four different types available in the Flormar range. There is a colour correcting cream which helps neutralise redness, blotches and pimples (green), one that helps brighten yellow tones in skin (purple), one for neutralising blue-green in the skin and banishing dark circles (pink) and another that provides extra coverage for problematic areas such as scars (peach). As I have rosacea I got the green one which is everything. Having used it for the past week I am so impressed with how it immediately banishes my redness and also has helped cover a few little pesky spots which decided to pop up for a visit. This stuff is the bomb and I definitely recommend it. Illuminating Primer Makeup Base – Michelle advised to only apply it to the oily parts of the face and also said to apply it to the collar bone which will make it pop, especially for any brides or if you are wearing a dress and want to accentuate your neck and collarbone. Again using the primer this week I have noticed my face is less oily and I have needed to touch up a lot less than usual. You can either use this after foundation is applied or before and the primer really does come through the foundation to give a gorgeous glow. 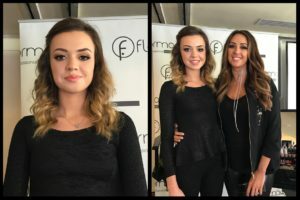 Perfect Coverage Foundation – On this occasion she used the Perfect Coverage foundation but also talked about the other foundations in the range including the Matt Velvet and Matt Touch. I got the Matt Touch which has amazing long lasting staying power and applied with the curved foundation brush from the Flawless Brush range (which is also a company owned by Paul), which is about to launch, makes for a flawless and even application. Just don’t forget to cover your neck as well Michelle pointed out. Foundation should be blended down the neck to avoid a sharp foundation line around your jaw. Another great piece of advice Michelle gave was when using makeup sponges they get full of the oil from your skin and bacteria and unless you are washing them every day you are just applying the oil and bacteria back onto your face the next day and if you are prone to spots this could be why. 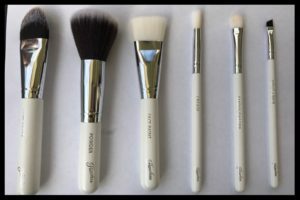 Instead she recommended to use a brush such as the face curve one from the Flawless range as you can spot clean them and its also easier to wash them. Flormar have a brush cleaner or another great way to clean brushes is with baby shampoo or in some occasions I use Top-to-toe wash which is brilliant at cleaning them. Just leave your brushes to dry overnight on top of a towel or piece of kitchen roll. I tend to wash my foundation brushes every two days and my powder, blush and eyeshadow brushes once a week. Perfect Coverage Liquid Concealer – Available in five different shades and with it’s creamy texture, this concealer is so smooth to apply and helps reduce bags under the eyes and dark circles and also helps eye make up stay all day. Eye Perfection Primer – Creates a flawless base for any eyeshadow that hides any discolouration on the lids and makes any colour and glitters pop. Available in four different shades. Matt Eyeshadows – Michelle used a mix of Chocolate Brown and Black to create a smoky eye and said how you can even use them on eyebrows because of the amazing pigment in them. Each individual eyeshadow comes with a little handy mirror under the lid. X10 Sculpting Mascara & Revolution Mascara – These mascaras really define each lash and the wand on the Revolution gets into all the little tiny eyelashes to provide volume and make those eyes pop. X10 mascara does what it says and enhances lashes to 10 times their volume. I personally love their Spider Lash Mascara which makes lashes appear thick, full and perfectly volumised. SoSu Lashes – Available in human hair and 3D Silk Luxury there is an array of styles in this range. I myself am loving Sara lashes for everyday use. Eyebrow Fixator Mascara – For grooming and fixing any wild eyebrow hairs and making them stay in place all day. Flawless Contour Palette – containing so many colours this is a must for any makeup junkie like myself and I have just ordered myself one. Loose Setting Powder – Containing a slight colour the loose powder’s hold onto the skin to set your makeup without appearing cakey or too heavy a finish. Bronzing powder for Face & Body – Michelle used this as a transition colour on the eyes and this is something I hadn’t previously done but am beginning to quickly fall in love with how it co-ordinates so well with the colour on your face. This bronzing powder is absolutely gorgeous to use on the body and brilliant to glamming up those legs. Terracotta Blush – All the powders are baked and the mineral powders are just gorgeous in the range. Lipstick – Michelle used Long Wearing Lipstick in L14 and Revolution Lipstick R05 mixed to custom make the beautiful pink shade. She also talked about how fantastic the lip liners are in the range and has snapped up nearly every colour for her makeup kit. I’m sure you will all agree the finished look is absolutely stunning and the photo does not even do the makeup justice. After the demo, Paul and his team along with Michelle had a pop up shop where everyone could purchase products and the opportunity to chat with Michelle and have their photo took. They also gave out spot prizes for the best dressed, best social media post and best question and I was one of the lucky winners myself and was presented with a 250 euro voucher to spend at Voltaire Diamonds. 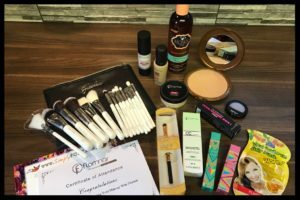 Everyone attending received a gorgeous pink bag full of goodies including Monoi Oil shampoo, Flormar lip gloss and liquid eye liner, Hair mask, Flawless shading brush, popcorn and £10 voucher to spend at Simply Foxy. Some of the contents of my goody bag and purchases from the day. If you are a fan of Flormar or love makeup then you should definitely book onto a master class if possible. 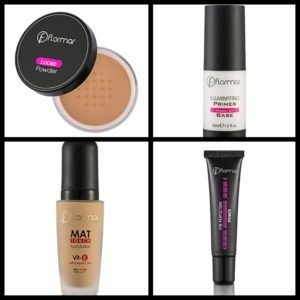 All the Flormar range and Flawless can be purchased in over 300 pharmacies throughout Ireland and also online at simplyfoxy.com and there are plans to open a retail shop in Dublin later on in the year. Paul also has said there are plans to bring the Flormar range into pharmacies up in the North which I cannot wait for.